You can use debugging to find BAdI that are available in SAP Program, SAP have two types of business Add-ins they are classic BAdI and new BAdI. BAdI have been redesigned to be an important part of the enhancement framework. Classic BAdI are instantiated with the GET_INSTANCE static method of the CL_EXITHANDLER class, Open Class CL_EXITHANDLER via SE24 and double click on method GET_INSTANCE. If you run any SAP Transaction code. 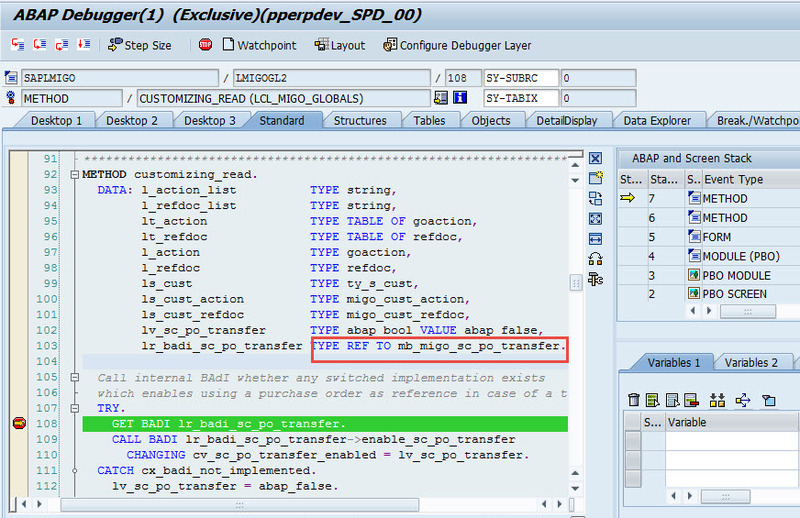 for example when you run tcode MIGO and SAP tries to instatiate MB_MIGO_BADI. The way to find new BAdI is different with classic BAdI, the new BAdI are instatiated using ABAP Statement GET BADI, This time you need to create breakpoint to stop at GET BADI command. Before you execute any SAP Transaction, please switch on debugging using the /h command. and run MIGO Transaction. and run Breakpoint at Statement. Run Breakpoint at Statement in Menu Breakpoints-> Breakpoint At->Breakpoint At Statement. After you run debugger and break at GET BADI command and execute the debugger by press F8. and debugger will stop in every GET BADI statement. for this sample in MIGO Tcode. As you see on the picture, you can get BAdI name in declare lr_badi_ac_po_Transfer for this sample and the name of new BAdI is MB_MIGO_SC_PO_TRANSFER.